The birth of the electrical industry began with the quest for pure iron. The movement of electrical technology has always depended on this workhorse of an element to make things happen. Iron is the core element used in many electrical things. Steel is made from iron and steel also helps electrical design by providing a strong structural support. Making devices smaller, faster and more efficient is key to moving forward. Mechanical, materials and electrical engineers work with iron products to improve technology. 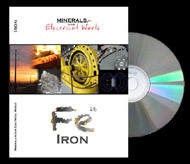 MEC’s new poster, Iron Mining and Processing for Electrical Uses, is a companion piece to the Iron in Our Electrical World video. The new poster traces the path of mining and processing taconite ore for use in electrical applications, further illuminating portions of mining and processing shown in the video. 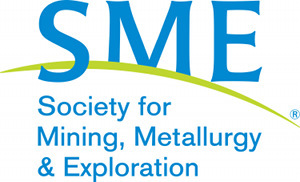 It also re-emphasizes the importance of mining in our electrical world and provides a colorful, informative piece for teachers to put up in their classrooms. Whether you are going to areas with slow or unreliable internet, or just like to have your own copy, you can get this video in hard copy. Order the video on DVD here. Learn more about electromagnetism and induction here. Below: Iron is able to concentrate magnetic fields, and can greatly increase the power of an electromagnet. 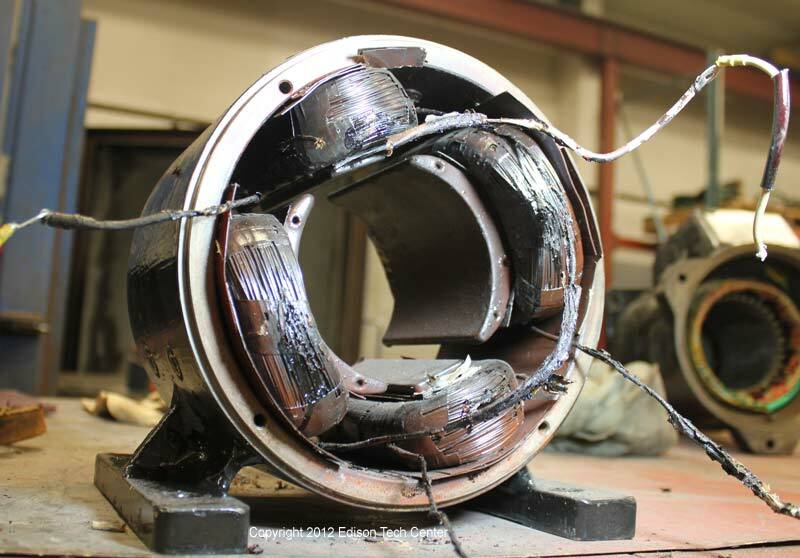 Strong magnets are necessary for generators, motors, transformers and other electrical uses. On the left you will see a simple 'air core' solenoid (electromagnet) vs. a 'd-core type' electromagnet with iron core. Iron is alloyed with rare earth elements like neodymium to very powerful small magnets. In the last 10 years, there have been many advances in making devices smaller thanks to using rare earths. Shallow speakers found in thin phones and tablets are made possible thanks to these advancements. Before the 2000s it was necessary to have deeper speakers made with ceramic iron magnets. Below: a neodymium magnet used in a hard disk drive. 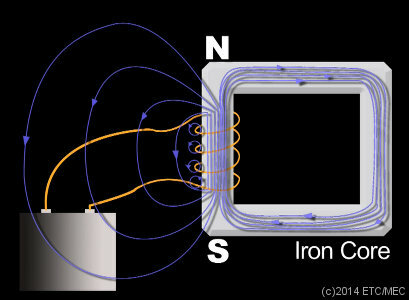 Unlike the magnet above which is used to physically move an arm in a disk drive, the iron below is used to concentrate magnetic fields and help convert high voltage to low voltage. Above: photo of magnetite, the protrusions are not crystals, but particles suspended by magnetic fields. The first commercial application of electrical technology was the creation of a powerful electromagnet which would separate pure magnetite from impurities. In the 1830s Joseph Henry developed the first powerful electromagnet in history. 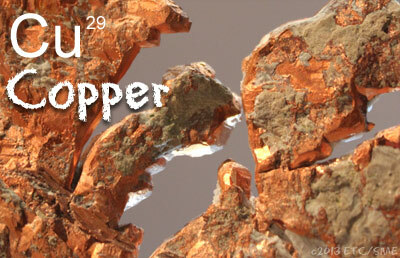 He used an iron horseshoe shaped core wrapped with insulated copper wire. Shortly after this he developed a device to help separate magnetite from silica gangue at Ironville, NY. The device used electrified iron rods that combed through a basin of iron ore, pulling out the purest of magnetite and depositing it in a separate bin. Ever since then the mining industry has been dependent on electromagnets in all forms to get work done. From induction lighting to huge motorized shovels, to conveyor belts, the mining industry depends on cutting edge electrical technology to get work done. 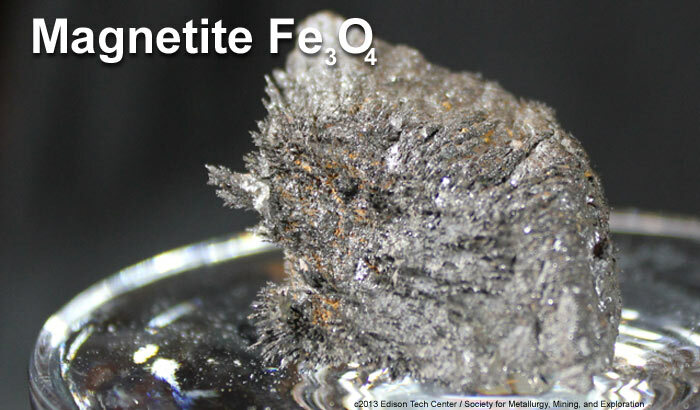 Iron can be useful in a basic forms like Fe2O3 (Ferric Oxide). Powdered iron is put onto a structural support like transparent plastic (video/audio tape) or metal disc (hard drive). "Heads" will magnetize the Fe2O3, changing polarity which translates into 1's or 0's. This is decoded into music or data. 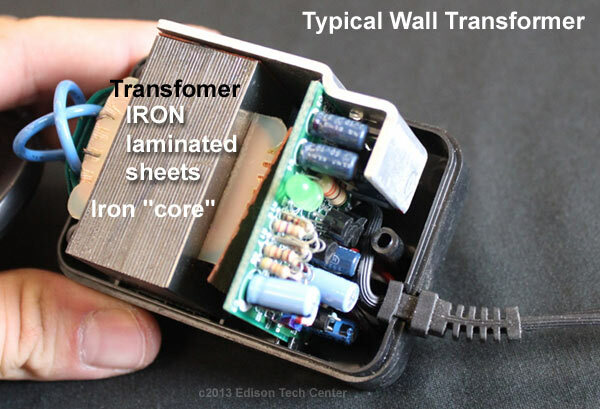 Powdered iron is also mixed with plastics to form transformer cores called 'composite' cores. Permanent magnets are most commonly made of iron in a ceramic material. Iron is combined with strontium carbonate to form permanent magnets in all kinds of shapes. Although you find other materials like neodymium which are more powerful for the weight, iron has a cost advantage. Speakers in limited spaces like laptop/phone bodies are best done with neodymium since they can make a louder sound with a small magnet. For most uses iron makes the most sense. Steel is used in electrical products in two ways: the first use is structural, and the second use is in magnetic cores. 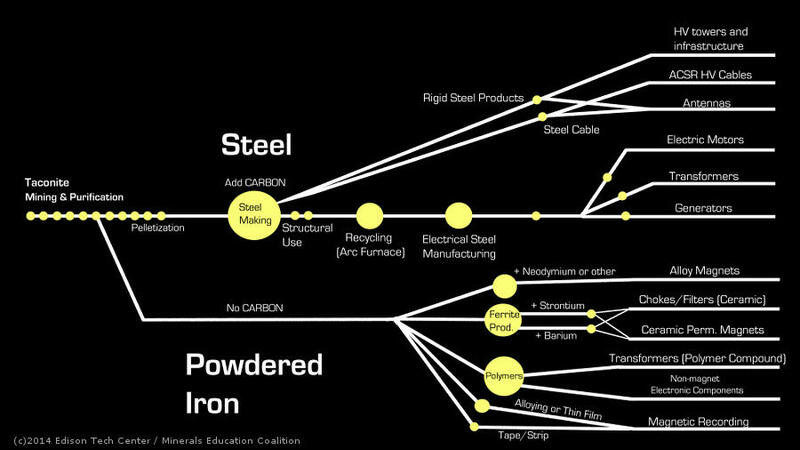 Steel is iron mixed with carbon and other materials. has a high carbon content. Carbon helps make the iron less brittle and therefore more useful. Like all metals iron has a grain structure. Each grain is a crystal, and you can adjust the strength you want by what you do to the grains. Rolling, annealing and acid baths can change the properties of the steel. Above: 'Electrical Steel' is used in motors of all sizes The copper windings are wrapped around the electrical steel cores. In the photo above there are 4 magnetic cores of electrical steel. Electrical Steel is the kind of steel used in magnetic cores for transformers, generators, and motors. Electrical steel has minimum carbon content and more silica content. By increasing silica (sand) you increase resistivity and reduce the potential for eddy currents. 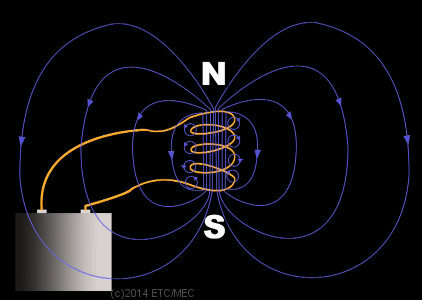 Eddy currents in the magnetic field cause loss of energy through heat. Electrical Steel is typically made of recycled steel in an electric arc furnace. 1. Melt scrap structural steel, decarbonize it, and add alloys to the molten mix. 2. Pour slabs of steel, roll the slabs into sheets. 3. Pickle the steel. Pickling is dipping the steel in acids to remove impurities. 4. Annealing and cold rolling of the steel. 5. Tension Leveling - the sheets are pulled and stretched to make them perfectly flat. 6. Stamping, laser or plasma cutting - sheets are cut into the shape needed. 7. Laminate the sheets - parts are coated with laminate material, this will insulate each sheet from each other. 8. Sheets are stacked into a core. Sometimes a set of bolts hold together the stack. Core shapes vary widely depending on the properties or sizes desired. 9. Winding - copper or aluminum insulated wire is wound around the core, creating the electromagnet. Some steel cores are also made by casting. Hot metal is poured into a solid cast. This sounds more simple and cost effective than laminations, but it is only useful for certain kinds and sizes of motors/generators/transformers.